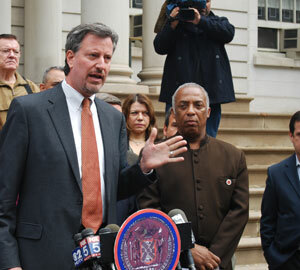 The Supreme Court's Citizens United decision "will warp our democracy forever," says de Blasio, "if we let it do so." The challenge to progressives is to refocus and re-energize grassroots attention on the destructive role money plays in politics. The challenges facing progressives of late are many, but so are the avenues through which they can be tackled. New York City Public Advocate Bill De Blasio stopped by The Nation's offices July 15 to explain some of the ways these challenges can be turned into opportunities for progressives. The left, de Blasio says, must refocus and re-energize attention around corporate money in politics and the Supreme Court's decision in the Citizens United v. Federal Election Commission case. "That decision will warp our democracy forever if we let it do so. It's such a horrible, beautifully written decision that it leaves us very few courses of action." he said. "We have to demand a recalibration of our approach, and the only way that happens is through the grassroots." Listen to De Blasio's discussion of the tools we have at our disposal in this insightful Nation Conversation. The challenges facing progressives of late are many, but so are the avenues through which they can be tackled. New York City Public Advocate Bill De Blasio stopped by The Nation‘s offices July 15 to explain some of the ways these challenges can be turned into opportunities for progressives. The left, de Blasio says, must refocus and re-energize attention around corporate money in politics and the Supreme Court’s decision in the Citizens United v. Federal Election Commission case. “That decision will warp our democracy forever if we let it do so. It’s such a horrible, beautifully written decision that it leaves us very few courses of action.” he said. “We have to demand a recalibration of our approach, and the only way that happens is through the grassroots.” Listen to De Blasio’s discussion of the tools we have at our disposal in this insightful Nation Conversation.